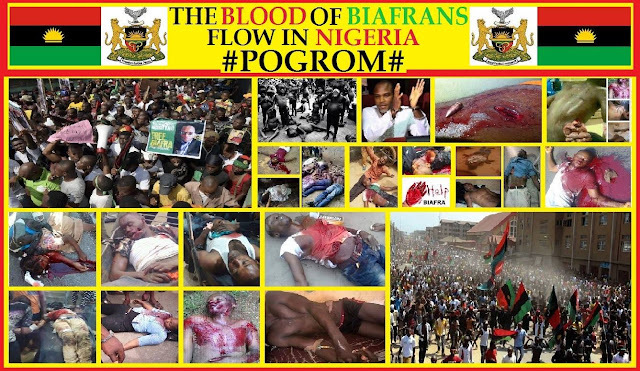 Nigeria’s killing fields, Buhari and challenge of peaceful resolution. By Joshua Amaezechi, a chaplain, is an analyst for USAfricaonline.com where this commentary appears, exclusively. Thomas Jefferson famously said that “The care of human life and happiness and not their destruction is the first and only object of good government.” But for many Nigerians, what is seen of the government and its agencies neither reflect a care for human life nor the happiness thereof. Many Nigerian lives are being destroyed as a result of lack of functional health facilities, poor security and lack of basic living infrastructure such as good drinking water and motorable roads. While security challenges posed by the terrorist group Boko Haram, though inexcusable, could be understood within the context of being an enemy force, the current security threat posed by the Nigerian Armed forces to the citizens of Nigeria is neither excusable nor understandable. In the past six months, Nigeria has witnessed several acts of extra-judicial murders involving the Armed forces. In northern Nigeria, many unarmed civilian Shi’a Muslims who were carrying out a religious procession were attacked with live bullets by the Nigerian Army and many of them were killed at the instant. Later their homes were raided and more of their members killed. The offense for which they were killed was that they held their procession on a Federal Highway and refused to dismantle their procession so that the Chief of Army Staff, General Brutai would drive by. d women and began to shoot indiscriminately. The most recent event in Aba, Abia State of Nigeria in February 2016 in which the Armed forces opened fire on members of the Indigenous People of Biafra is worrisome. It is worrisome because these men and women were not committing any crime but were only singing and praying for the release of their leader, Nnamdi Kanu whom they factually argue had been unlawfully detained by the Nigerian Government. There are some issues here. It is a universally acceptable principle of justice that, even where crime is being committed, the suspected offenders’ right to life is sacrosanct; that the offender remains innocent until proved guilty by the Courts. But this principle was completely ignored as the men of the Armed forces shot their way through a mass of singing and praying youth. The number of those killed on the spot vary from ten to fifty depending on the claims by the Indigenous people of Biafra and the Nigerian Army. The number of the injured and hospitalized have continued to generate claims and counter claims between the Indigenous People of Biafra and the Nigerian Army. Irrespective of the number killed and injured, there is no justification for the presence of the Army in that gathering and the shooting of civilians with live bullets is a practice that is strange to civilized security operations in a democracy. This latest demonstration would be one of the many, more than seven peaceful demonstrations being carried out by the Indigenous People of Biafra against the Nigerian Government during which many of their members had been killed by the agents of State. The courage and persistence shown by these young men and women raises the question as to why they have continued to gather and to carry out their peaceful demonstration in the face of obvious threat to their lives. What are these men and women demonstrating about? Are these men and women, many of whom are college graduates, miscreants as was once publicly stated by retired General Olusegun Obasanjo? The obvious answer is No. These men and women were demonstrating for equity and justice and for the rule of law. They were demonstrating for the restructuring of the Nigerian state so that true federalism can be practiced and so that they can have the freedom to form their own country if they wish. At the proximate level, they are asking the Government to release their Leader, Nnamdi Kanu from detention as has been directed by the Courts. They are also calling for a referendum on Biafra, so that there right to self-determination can be affirmed. While the merits of their demands might be controversial, they are not the only bodies calling for the dismemberment of Nigeria. For nearly six years, Boko Haram has waged a war against Nigeria seeking to establish an Islamic Caliphate of Northern Nigeria. In Western Nigeria, the Oduduwa People’s Congress calls for the establishment of the Oduduwa State for the Yoruba ethnic group. All these, including other unmentioned militias point to the need for the government of President Buhari to explore peaceful options for addressing issues of dissent and national security. Many were happy when President Buhari extended the olive branch to Boko Haram, literally begging them to accept his amnesty and come to negotiate with him. But many are curious as to why the same olive branch cannot be extended to Nnamdi Kanu and other pro-Biafran demonstrators. Why a President will be willing to negotiate with a terrorist organization that has killed thousands of his citizens but unwilling to negotiate with groups using non-violent strategies is baffling to objective minds. While the Federal Government of President Buhari should address this obvious contradictions, the State Governments have a responsibility to investigate these extra-judicial killings happening in their States. It is commendable that Governor El Rufai of Kaduna State had instituted a panel to investigate the killing of the Islamic Shi’as — but it will even be more commendable if justice is done and appropriate measures be put in place to avert the militarization of Nigerian Democracy. The Governor of Abia State Governor Ikpeazu must not shirk his responsibility as the Chief security Officer of his State, with constitutional responsibility to protect the lives and property of citizens. The manner in which more than ten young men were gunned down in a peaceful demonstration in which video recordings clearly showed that these young men were singing and praying is provocative and condemnable. He must as a matter of urgency institute a panel of Inquiry into these deaths and ensure that those trigger happy men of the Armed forces are brought to account for their service. This is the minimum that he can do on this matter. Despite the responsibility of the State Governors, the buck stops at the table of the President and Commander in Chief of the Armed forces, President Muhammadu Buhari. This President must as a matter of urgency call his military men out of the streets of Eastern Nigeria. The reports from some international observers, civil rights groups and the Indigenous People of Biafra concerning the disappearance of their members (who are mainly the Igbo ethnic group of Eastern Nigeria) bring back to memory the era of the Gestapo in Hitler’s Germany. Similar reports and rumor eventually turned out to be the foundational implementation of a grand evil policy to eliminate the Jews from the face of the earth. For the Igbo of Nigeria, such rumors are not taken lightly given the loss of millions of their people through a deliberate policy of starvation in the hands of the Nigerian Army from 1966 to 1970. While the Nigerian Military must continue to deny such allegations, they must go beyond denials to allay the fears of citizens that they are functioning to protect them and not to harm them. President Buhari need to continually remind the men of the Armed forces that Nigerians chose democracy and that attempts to militarize the civilian space is a negation of this choice. He should take concerted efforts to douse the tension in the country by dialoguing with all agitating groups, including those whose path of agitation are peaceful. Doing this will be a mark of strength for his government rather than weakness.